No church in northern Sonora has ever held the same degree of fascination created by the lonely ruin of Cocóspera. Situated on a high bluff above the picturesque Cocóspera valley, this mission has witnessed the rise and fall of empire. 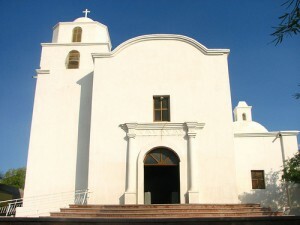 The original church was the near twin of Remedios mission. The facade of the Kino church was flanked by large, square defense towers which later formed the bases for twin bell towers. The windows and doors were constructed of posts and lintels with flat surfaced splays and wood-grill apertures. The interior walls were coated with a thin white plaster and decorated with red ocher paintings. When the Franciscans renovated the mission in the late 18th century, they lined the adobe shell with fired bricks, raised strong, rock buttresses outside the nave, and erected a new brick and stucco facade. The church interior was faced with brick and heavily plastered, thus permitting an exuberance of raised plaster reliefs incorporating a variety of swags, urns, and scallop shells. 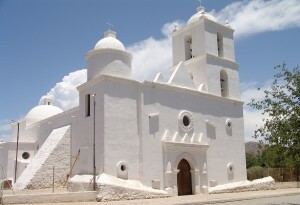 The mission ruin of Cocóspera is easily reached today by taking the Highway 2 from Imuris to Cananea. The site is located on the northwest side of the road. Perhaps it is too accessible because it has been continually ravaged by misguided treasure hunters whose pick-hammers and shovels have almost destroyed this monument to man and God on the desert frontier. San Ignacio de Caburica, six miles up river from Magdalena de Kino, rests peacefully near some low hills around which the river veers on its southwesterly course from Imuris. 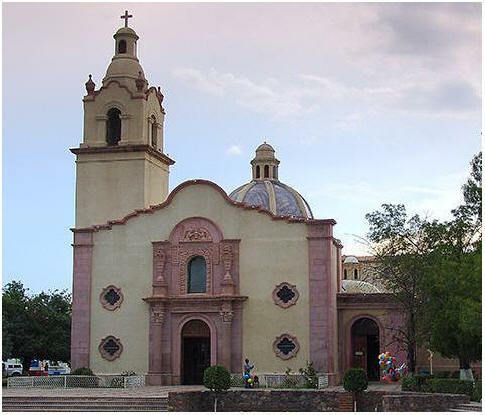 San Ignacio is one of the true delights of the Sonoran mission frontier. 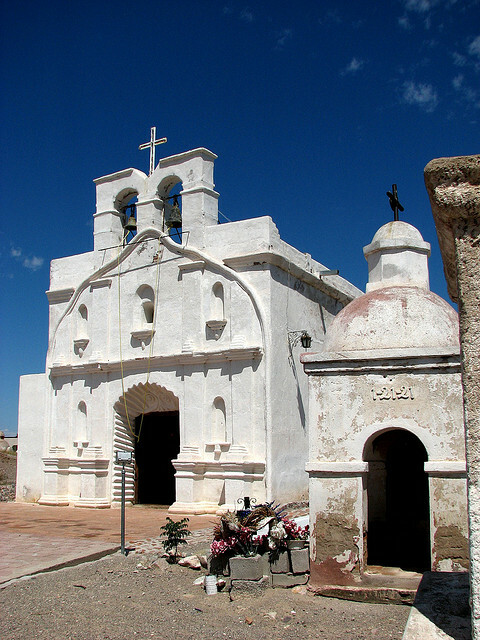 The mission site was chosen by Padre Kino in 1687 because Caburica was a populous Piman rancheria. A series of small chapels served as visitas or as temporary buildings until 1693 when Padre Agustín de Campos arrived to transform Caburica into a cabecera. His new church was burned during the Pima uprising of 1695, but soon rebuilt. For forty-three years San Ignacio served as the headquarters for Padre Campos, one of the longest terms of missionary service on record in the Pimería AIta. Campos’ longevity and missionary skills made San Ignacio a training ground for new Jesuits moving into the missions of the Pimería. Highly skilled in the various Piman dialects, his presence at San Ignacio naturally turned it into a language school and proving ground for those who would be assigned to other more distant churches. When the whole northern frontier was consolidated into the diocese of Sonora in 1779, San Ignacio drifted into oblivion. Today the pueblo is a jewel of tranquillity. 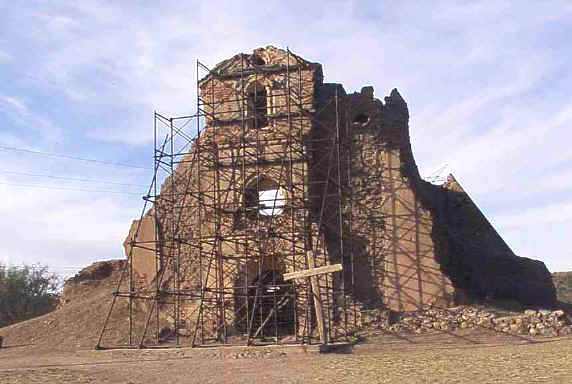 His new church was set on fire during the Pima uprising of 1695, but was soon rebuilt. For forty years, one of the longest periods of missionary service ever recorded in Upper Pimería, San Ignacio served as headquarters for Father Campos. Longevity and ingenuity missionary of San Ignacio Campos made a ground exercise for new Jesuits who came to the missions of Pimería. Of course the presence of Campos to the mission, because of his remarkable knowledge of the various dialects Pima, San Ignacio had become a language school as well as a testing ground for those who would be assigned to more distant churches. When in 1779 the entire northern border was collected in the Diocese of Sonora, San Ignacio was forgotten. Today, the pueblo is a gem of tranquility. 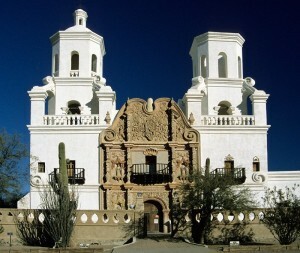 The foundations for the great mission of San Xavier del Bac were laid in 1700 by Padre Eusebio Kino. He had been impressed some years before by this largest of the Pima villages along the Santa Cruz. But even after the mission was completed, it remained vacant throughout the first decades of the 18th century. 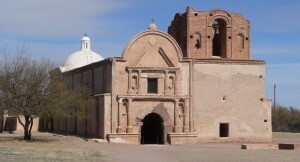 Espinosa’s large adobe structure was the same one utilized by the Franciscans when they took over in 1768 from the exiled Jesuits. It served as headquarters for Fray Francisco Hermenigildo Garcés until he was transferred to Tucson to be in close support for the newly constructed presidio. 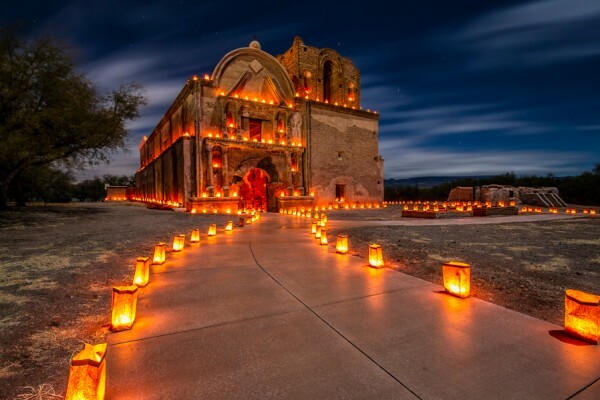 Today, mission San Xavier del Bac is one of the colonial art treasures of America. Its baroque architecture is a monument to the splendor of the European civilization that first came to the desert frontier of Sonora and Arizona. Surrounded by fields of grain and cotton and by the adobe dwellings of the Papagos, it is a page from the past that has been forgotten in the haste of freeways and the waste of crowded cities. Tumacácori’s past is elusive. 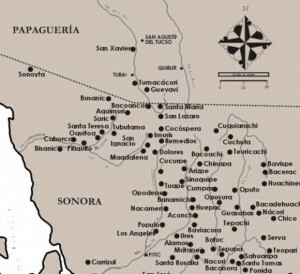 All the maps of Padre Kino indicate an Indian village of Tumacácori on the east bank of the Santa Cruz Rjver. Apparently the site was a convenient crossing place where the waters of the river had a chance to broaden out. From Tumacácori the trail crossed the river to the west and continued on down to San Xavier del Bac. Throughout Jesuit times there was nothing more here than a small wayside chapel, and its importance varied with the shifts in Indian population. It seems that because of recurrent Apache raids the Sobaipuris pulled out of the San Pedro river valley and took refuge at these missions within the sphere of Spanish protection. Since the present mission bears a new name, San José de Tumacácori, it is most probable that the church was erected on a new and somewhat different site from that of Kino’s. This mission was erected in 1773 and rebuilt at various times. Construction was suspended in 1822 due to the lack of funds although the church remained in use until secularization became effective in the 1840’s. Tumacaccori is now part of the Tumacácori National Historical Park. In 1908 it became National Monument. It was then raised by a bill of the Congress to the status of National ParK in 1990.